Writer Abroad is honored to have "Expat Expert" and five-time author Robin Pascoe join her for a discussion about creativity, writing, living abroad and how one makes sense (not to mention a successful career) out of all that. Robin is currently back in Canada (and enjoying the winter Olympics) after living in Bangkok, Taipei, Beijing and Seoul. Since her repatriation, she's become more of an advocate for spouses abroad than ever before, proving a career formed abroad can continue and prosper even after returning home. Today you are known as the “Expat Expert” and you’re the author of five books on expat life, the most recent being A Broad Abroad (great title, by the way). Can you discuss how your career as a writer and “expat expert” was born and how it evolved? Glad you like the title, "A Broad Abroad" as the book was originally called "Culture Shock: A Wife's Guide" when it first came out in 1992. But I always wanted to call it "A Broad Abroad" to indicate that there would be a lot of irreverence thrown in! I've been a journalist for over 35 years now--radio, tv, print, documentary, new media--but when I married a Canadian foreign service officer (almost 30 years ago!) there was simply no way I was going to be allowed to be a journalist with press credentials and a diplomatic passport. So initially, I turned to freelance magazine and newspaper writing (and some radio news as well) and then decided to write a book. Yes, 'a' book that ended up becoming 5, a website, a speaking career, and a reputation as an advocate for the expat spouse. But writing has always been the theme running throughout everything I have done. I've been writing since I was a kid. Ironically, the first thing I ever wrote, at 14, was an one act play about identity! Expat Expert grew out of a newsletter I started for new moms (when I was one too) in Bangkok. My pre-natal group started a mothers support group, which is still growing strong all these years later http://www.bambiweb.org/. It was the impetus for me to write informational material for mothers abroad and later, for families living overseas. What advice would you give to those living abroad who are also hoping to become writers or published authors? One key piece of advice I have been handing out a lot lately it seems is this: find a niche. Journalism, media, communications, and everything related to it has become so fine tuned now to particular demographics, interest groups, and subjects. With so much 'out there' now in search of an audience, I believe the best way to find a place is to offer something very specific (and unique of course) that is needed or wanted or both. A lot of homework and market research should go into selecting a niche, though. I can't tell you how many people have written to me over the years saying there is a need for this or that concerning expats (book, website, blog, you name it) and I have to ask them: did you do your homework? There a thousand just like that! The other advice I offer (and try to take) is to understand why you are writing, why you are pursuing a creative career. These are important questions that need to be asked and reflected upon. I wrote my first book because I was angry that spouses were being sent out without any knowledge of what they were getting into (this was the age of the dinosaurs, the early 80s). I also wanted to write a book and everyone said, 'write what you know'. I had no idea if it would ever be published but I was very happy writing it. I loved the process. I loved having a 'writing life'. I was not after fame and fortune. I just didn't want to go brain dead! So what's your motivation? That's a question writers need to ask themselves. What is the best way that you’ve found to market your books to a globetrotting audience? The absolute best way is to get out and meet your readers. Of course I sell books online, but it's when I have been speaking about them (and usually after the lecture, not before) that people would buy them. I would also market the books when I was marketing my speaking trips by writing articles or giving book excerpts to expat websites and organizational magazines. The travel was brutal, no question about it (and especially for someone like me who has suffered terribly from fear of flying!) and it wasn't cheap. I had to invest in myself. So if it meant using my husband's points (because he travels a lot! ), staying with strangers (but always bringing nice gifts!) and doing a lot of heavy lifting myself of book boxes (because I would be by myself most of the time) then so be it: I did it. I was fortunate in the last number of years to have a Canadian moving company sponsor with whom I created a win/win scenario. I spread their name around (and their partner friends) to an audience they were trying to reach (expat spouses and parents) and in return, they paid for my trips. It was a lucky break for me, but sponsorship to get to international speaking engagements is very, very helpful! The new media like Facebook etc has been very helpful too....use everything I guess is my short answer, but get out there in the world and speak, sell, speak, sell! After many years abroad, you returned to Canada. What was it like moving back to your home country after so many years abroad, especially after having built your identity and career around being an “expat expert?” Do you ever really get over expat life? I didn't become the expat expert until after I repatriated. Ironic, eh? I wrote my first two books when we were still in the diplomatic life and had intended, literally, to run them over with a truck once we left the life. I wanted to return to mainstream journalism in some way and forget about being an expat altogether....But then, like they say, life can turn out unexpectedly! I was invited to speak to Shell in The Hague and it just seemed my speaking career took off after that. The Internet was also conveniently invented and amazon.com and self-publishing models....these tools all made it easy to pursue this full time. But it took that speaking engagement during a terrible repatriation on my part (everyone else in the family was fine!) to encourage me to write Homeward Bound. I had asked the audience, many repatriated Shell wives, if they felt as tired as I did! And I commented that if I wasn't so tired (and depressed, truly for the first time in my life, in beautiful Vancouver of all places) I would write another book just about repatriation. The audience all looked at me and said: Write that book! So I did, and felt great again because I was writing again! But I had to go through the 18 months to two year re-entry process before I could write that book. The rest just followed. And no, we never get over expat life. I believe we are changed forever by the experience. Once a globalist (as I really think are), always a globalist! I would just add, Chantal, that when I found your blog, I was impressed the most by your tagline: 'surviving and thriving as an international creatives person.' I think that really is what so many expats are seeking, and not just writers, but artists, photographers, dancers and so on. For expats, the cultural experiences of travel and daily life in a foreign country are big sellers....but what about feeding the individual's creative soul? That's what I think you are encouraging; it's certainly been one of my main 'talking points' all these years when I have held writing workshops. Sometimes people think they can only have a creative life in their own country with its support systems, language, classes they can take etc....but I think living abroad gives someone an extraordinary opportunity to be creative and I hope you succeed in your own work...and also in encouraging others to follow their own passions. As the Expat Expert, Robin is well known abroad for her inspirational and informative articles, corporate presentations, and best-selling books. She is the author of five widely-used books on global living. Since 1998, her popular website has served as an international meeting place, discussion group, and source of advice and information for hundreds of thousands of expats world-wide. Thanks for this interview Chantal and Robin! I had the pleasure of meeting Robin face to face in Istanbul last summer and it was like being reunited with a long lost sister. We expat writers and publishers have A LOT in common. It's so true that not only do we have the opportunity to be creative abroad, no matter what it is we do -- it can also be a matter of survival. I appreciate Robin's point about discovering not only our niche but also our motivation to write -- figuring that out will help us direct our efforts and better meet success. Who am I, what do I care about, who do I want to serve? Glad you enjoyed the interview. It's great that you both met face to face. I also hope that in my travels I can meet the writers scattered around the world that are part of this blog. I hope that other writers who visit Switzerland also don't hesitate to contact me to meet up. No matter what we write about or where we live, we are connected through our understanding of the expat experience. Here's to all of us! Great interview..I thoroughly enjoyed reading it. 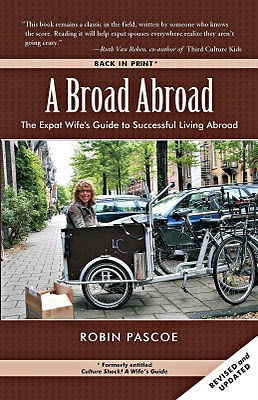 I believe the experiences of expat spouses are a lot similar on a broad scale..I have just received a copy of "A broad abroad" from one of my friends and will be delving into it soon. And this is one of the most wonderful and honest lines I have read : " Once a globalist, always a globalist!" Keep up the good work!! Hi Orangesplaash, you might also like Robin's "A Moveable Marriage", which also offers great tips for spouses abroad. I read it last year. And yes, I love the "globalist" line too. So true! Great interview! Thanks. I definitely agree with Robin's comments about the tiredness of being a re-pat - expatting it was so much easier! My (now) husband introduced me to Robin in 1978, while they were both working for CBC Windsor. It was very interesting to learn that she had become a relationship expert, giving advice to expat women. Shortly after meeting her, my partner of 5 yrs and I left for Asia, then to live for some time in the Middle East. My long-planned-for trip was far less joyous than I had anticipated, due to some prior, painful info I'd received, that has stayed with me to this day. Too bad such intuitive insight into expat relationship issues was unavailable at the time, especially in dealing with the overwhelming "anger & resentment". She's now inspired me to write an account of the emotional difficulties I had to deal with, in order to help others to be wary of similar pitfalls in their paths. Though writing that dissertation or maybe essay writing service reviews, initial thing for you to do will be to create specific. It is crucial you do have a particular in addition to precise carrying a child while using problem before you begin writing. Several things are usually and so simple you could start off of writing without delay. Review files ar common accountabilities the instant all over college or it could be university. specificessay paper including ideal customer survey establishing support files with regards to folks from the Britain. This is the great group of links to be able to images sites : however the formatting causes it to be challenging to be able to check just about all promptly : you need to embody all of those with google's viewer as being a open public discussed number and then anyone will register all of them because of this. Nevertheless My spouse and i told a person college essays support it is among the very best companies. I am searching awesome news and idea. What I have found from your site, it is actually highly content. You have spent long time for this post. It's a very useful and interesting site. quite required me to check out in addition to do so! Your current creating tastes continues to be astonished me. Many thanks, quite great write-up. If you are would like to additional creating jet click the above website link. Could be that help you. many thanks. I want to to thanks a lot due to this specific study. I have furthermore book-marked a person with Towels Wholesale regard to checking out brand new posts. I have learned so many things through this awesome interview. You have shared such a valuable interview with us. apa research paper format , expert research paper editing. Individual Humans. To be a human being we have been reasonable canine, nonetheless we all bring about more geo marketing destruction than nonrational animals. Tanks pertaining to giving. is it a good enough score to get me into a good college? i am planning to pursue the economics undergrad program. This is cool post and i enjoy to read this post. your blog is fantastic . partytent huren venloThank you for the work you have put into your nice blog. We will bookmark to your blog because it is very informational. We love the site and will come back to see your new posts. Very good work really your site is really awesome and too useful. I enjoyed visiting your site. You have done a truly outstanding Job. You can basic utilize their administrations for doing your school affirmation article composing, examination papers, postulation papers, task papers and what not that might be taken care of by expert author groups submitting you the custom expositions on time utilizing either UK or USA English focused around your decision. Expert Writers is known for its writing skills in education. They are the one whom complete reliable over research and analysis throughout the subject. Main role of writers is used in academic writing to persist them and assured their quality of writing. s stand out of the herd. There is something special about them. It seems to me all of them are really brilliant! I love when a writer can match a subject title with its content. THANKS!